I knew what I wanted for dinner this evening. I remembered seeing the photo of it in one of our cookbooks. 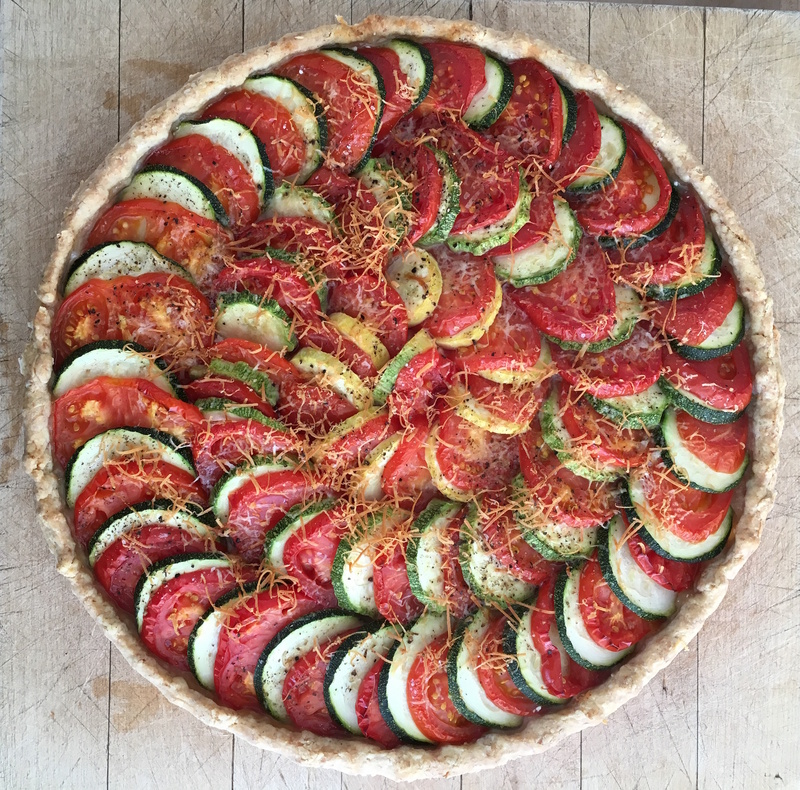 I remembered making it once, ages ago–a tomato zucchini tart. I couldn’t find the recipe, though, so I punted. The resulting tart was spectacularly good. Here’s the completely untested recipe I made up on the fly. Make your favourite pie crust. Line a large tart pan with it and chill it in the fridge while you prepare the rest of the tart. Slice zucchinis and tomatoes into 3 mm (1/8 inch) slices. How many? I don’t know…enough. You can always slice more as you go. Spread a generous layer of chevre (a soft goat cheese) on the bottom of the crust. Sprinkle freshly grated parmesan cheese over the top, along with a generous grinding of black pepper and salt. Bake at 210°C (400°F) for about 40 minutes. I served this with corn on the cob and a cucumber and onion salad for a mid-week meal that felt more like a weekend feast.